Chi Chi is a quadruple amputee but doesn’t allow her disability to determine her abilities or potential. She exemplifies resilience and inspires people to never give up no matter what challenges they may face. Chi Chi shares her love with the world through her social media accounts and as a certified Therapy Dog. 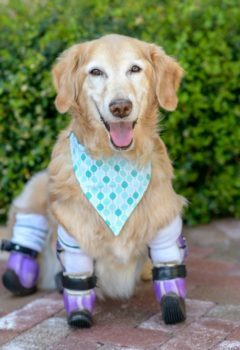 She encourages others to share love and kindness abundantly and hopes that her story encourages people to consider adopting a pet with special needs. The love that Chi Chi provides to the world far outweighs the extra effort and attention she requires.